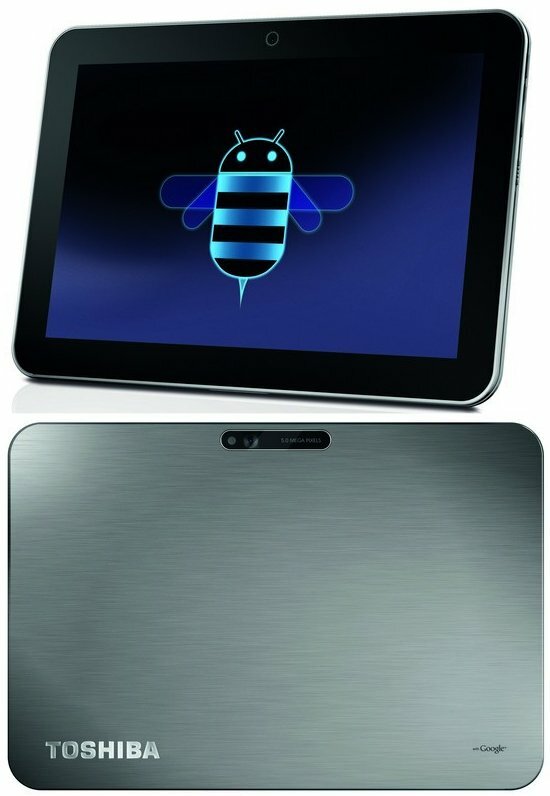 Toshiba demonstrates the AT200, a forthcoming 10.1" Android tablet with a thickness of just 7.7mm. The device is powered by the TI OMAP 4430 1.2GHz processor, offers up to 64GB storage capacity, microSD support, a 1280 x 800 pixel resolution, 5MP rear and 2MP front cam, and a battery life of up to eight hours. Pricing is unknown and availability is expected sometime by the end of the year. Toshiba Europe GmbH unveiled an exciting new product today – the ultra-thin 25.7cm (10.1'') AT200 tablet. Despite measuring only 7.7mm from front to back, the Toshiba AT200 delivers a broad range of essential ports and interfaces. It offers an amazing wide-view display for comfortable content consumption plus full web browsing capabilities to meet the preferred usage for tablets. Every bit as powerful as it is stylish and robust, this tablet is built to exceed expectations. The Toshiba AT200 will be available in the fourth quarter of 2011 in Europe.